November is one of the busiest months of the year with a calendar filled with cultural, culinary, and sports activities, plus social activities and dash of Mexican tradition. It’s the start of the best season to be in the Riviera Nayarit. The Riviera Nayarit and event organizers are announcing 12 events this month that will not only attract thousands of visitors but will also generate an important revenue for the area. Although this isn’t one of the most deep-rooted celebrations in the region, nonetheless the local cemeteries are brimming with floral arrangements in memory of the dearly departed. Every year the Magical Town of Sayulita celebrates the ¡Vivan los Muertos! Festival with a varied program that includes an altar exhibit, pilgrimates, and a nighttime procession to the cemetery. Click for more info. This new and unique project focused on health and wellness features special guest Deepak Chopra, who is known around the world for pioneering holistic medicine and personal transformation. The event includes a series of conferences, workshops, and activities open to members as well as the general public. Visit the page. Fishing aficionados have a pending appointment at the Punta Raza Beach Club—El Monteón’s window to the sea—to participate in this family tournament that welcomes professional and fishing enthusiasts from the region. Among the unique characteristics of this tournament: they award a symbolic award to the largest catch in the different categories. More details here. Come enjoy the Riviera Nayarit Jazz Festival with Argentine singer Karen Souza and new material from Velvet Vault, produced by her in collaboration with Japanese musician Toku. The event will be held at Palmeiras Jardín de Eventos in Nuevo Vallarta. Tickets are available at Galerías Vallarta, Súper Colchones Plaza Marina and Plaza Lago Real, and Notaría Careaga in Paradise Village (from Monday through Friday). Tickets include open international bar and hors d’oeuvres. Watch the video. This is one of the destination’s anchor events and includes the participation of over three thousand bikers from 15 states in Mexico. The town is bursting at the seams during these few days and the parade of bikes down the port’s main streets is a sort of kick-off for high season. It all takes place at the esplanade of the iconic port of San Blas: contests, live music, and exhibits. For more information. 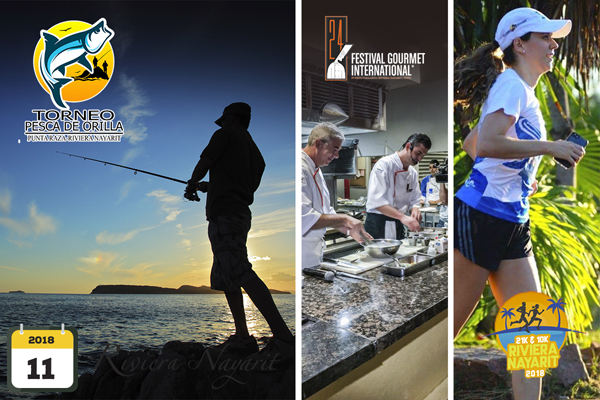 For 24 years, this festival has put Puerto Vallarta, Riviera Nayarit, and Tepic at the top of the international culinary world. Top international chefs bring new ideas to the table and over 30 restaurants and hotels participate as well, transforming these destinations into the consummate culinary, entertainment, cultural, and tourism showcase. For more information. This is an open invitation to all runners and their families to participate in the 10th Riviera Nayarit 21K and 10K. This race is endorsed by the Mexican Federation of Athletic Associations and authorized by the Association of International Marathons and Distance Races (AIMS). The race’s excellent organization and the local natural landscapes are just two of the elements that continue to position this event among the top of its kind in Mexico, the United States, and Canada. For more information. This is unprecedented event will feature the culinary genius of Guillaume Morancé, Maître Cuisinier de France and Executive Chef at Grand Velas Riviera Nayarit; Raúl Hernández, Executive Chef for Piaf restaurant; and special guest Steve Benjamin, disciple and protégé of Michelin-star chef Joël Robuchon, Executive Chef for Las Vegas’ L’Atelier restaurant; winner of Food Network’s Chopped! ; and Executive Chef at the Waldorf Astoria in Beverly Hills. For more details. For the third year in a row, the Magical Town of Sayulita will host this event that includes the participation of 25 Wixaritari groups offering their extraordinary cultural riches in demonstrative workshops showcasing embroidery, beadwork, painting, etc. as well as the Indigenous Paradise and Culinary Pavilion. The latter includes a variety of traditional Nayarit food. Of note is the Traditional Medicine Pavilion with the participation of traditional medicine doctors. More information. Every year this event, organized by The St. Regis Punta Mita Resort and Four Seasons Resorts, welcomes renowned wine experts, tequila masters, chefs, and visitors to be a part of a three-day gourmet tour de force that includes a series of wine and tequila tastings, parties, gourmet meals and cooking classes, along with a two-day golf tournament on the famous Pacífico and Bahía courses, both designed by Jack-Nicklaus. Visit their page. The Punta de Mita Foundation extends an invitation to its fund-raising events for the local community, including the well-known Punta Mita Charity Golf Classic at the Punta Mita Golf Course. The play format is the Foursome A-GoGo. The tournament benefits Peace Punta de Mita, the Punta de Mita Foundation, and the Community Project, which will become a cultural and personal enrichment center for the northern area of Bahía de Banderas. Click here. The winter season has arrived and with it, Punta Mita’s most delicious flavors in an event that brings together some of the area’s favorite chefs, restaurants, tequila makers, cellars, guest DJs, and mixologists to demonstrate their new and signature proposals for the upcoming season. Click for details.